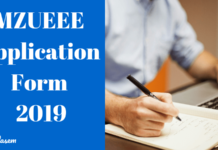 Mewar University has released the application form for eligible candidates to admission in UG, PG, Diploma programmes for the academic year 2019-20. Interested candidates must fill and submit the application form for respective programmes before the last date. 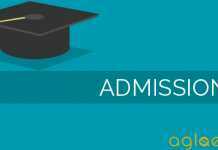 Get here complete details of Mewar University admission 2019 in various UG, PG and Diploma courses. Latest: Offline and online application forms have been released of Mewar University 2019 for UG, PG and Diploma Courses. Humanities, Social Sciences & Fine Arts. Science & Technology (M.Sc / M.Phil). Humanities Social Sciences & Fine Arts (M.A / M.Phil). Diploma in Architecture/ Civil/ Chemical/ CSE/ ECE/ EE/ ME/ Plastic Engg./ Petro Chem/ Mining. Diploma in Leather and Footwear. Interested and Eligible candidates may download their application from the official website as well as the link provided below. The registration for the Diploma program through an entrance exam, which is held every year. Apply Online: Click here to apply online for Mewar University UG, PG and Diploma Courses 2019. Please keep your Passport size photograph, Signature, Matriculation & Intermediate Certificate ready before filling the form. The photo size should not be more than 50 KB. Allowed photo types: png gif jpg jpeg. Images must be within 640×480 pixels and the photograph within 480×640. You can claim your Provisional admission fee within 15 days of registration. Rs.1000 will be deducted as processing charge. 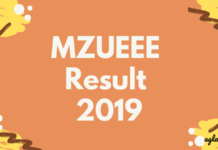 MZUEEE Result 2019 – Check The List Of Selected Candidates From Here!